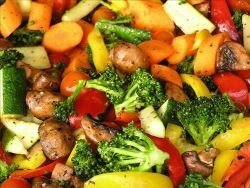 This Grilled vegetables recipe is a low fat recipe, which is easy, tasty and healthy. If you make this at least once a week and have these with a light soup, instead of a regular meal, you will never hate going on a diet. Also you can have these as a salad, with roast chicken, fish or anything really. The flavor of all these assorted vegetables is so good, you can eat them as they are. Grilling is a good way to retain most of the nutrients in the vegetables. So what can be better than having a low fat meal made of healthy vegetables and being able to enjoy it too. To make these healthy vegetables you can use any vegetables of your choice. The recipe here is only a guideline. Try to grill the onion though, as the caramelized onions give this recipe a good and distinct flavor. Arrange all the vegetables in a baking tray. Brush a little with olive oil, especially the onions and bake for 15-20 minutes. Place under the grill for 10 minutes till they get a golden brown color. Take out and while still hot, drizzle some more olive oil if you want and sprinkle evenly all the dry ingredients. Serve with salsa or any other dip or just eat it like that.